One of the many aspects of GeekGirlCon that sets it apart from other conventions is its commitment to welcoming geeks of all ages. We don’t just tolerate our kid attendees, we design the weekend with their interests in mind. Whether that means keeping our 18+ programming scheduled in the evenings or setting up a kids-only cosplay contest, we’re serious about keeping our evolution reactive to the needs of even the littlest con-goers. In terms of kids programming, the now-classic GeekGirlCon event we’re proudest of is our DIY Science Zone. This year will mark the Zone’s eighth iteration, with each con bringing bigger and better additions. Part of the reason we’re able to keeping growing and changing when it comes to this special-ist of events is because we’ve got a community that shares our values and knows that accessible science education needs funding. Trivia at Mox Bellevue This Sunday! In case you missed Teal’s announcement about it—or in case you saw it and, like me, just have a bad habit of meaning to put things on your calendar and then forgetting to actually do it—GeekGirlCon Trivia Night is this Sunday, September 9, from 2:00 p.m. to 4:00 p.m. at Mox Boarding House in Bellevue! Bring a team or join one when you get there and show off that geeky brain of yours in front of people who will appreciate it! Tickets for players of all ages are $7 each online or at the door. The fabulous prizes include a $100 Mox Boarding House gift card, passes to GeekGirlCon 2018, and more. Hope to see you there! Source: Giphy. Description: A group of penguins hopping after a butterfly. It’s officially September, and you know what that means! Fall is right around the corner, and as much as we’ll mourn the days of bright blue (or smoke-filled, ugh) skies, carefree days spent outside, and plentiful iced beverages, autumn holds its own special allure for those of us who prefer our temps a little less extreme and our pursuits a little more indoors. Without further ado, take a peek at what’s coming up this month! Start the fall off on a high note, and check out the science behind sound – For the first part of September, we’re spotlighting music – how instruments work, what happens to your brain when you hear sound, and more. Our ensemble of hands-on activities and demonstrations are a great way to get your brain tuned up and ready for fall. This event is included admission (separate tickets are required for IMAX and Laser Dome shows). Join us for the 9th annual Cider Summit Seattle. This year’s event will feature nearly 200 ciders from over 50 producers, plus cider cocktails and apple spirits! Specially paired food from Capitol Cider & more. Your well-behaved dog is welcome and can get water & treats in our Dog Lounge! Also check out our event store with bottles-to-go and festival merchandise! Trivia at Mox Boarding House on September 9! Calling all geeks (AKA every person reading this post)! Join GeekGirlCon Sunday, September 9 for an afternoon of trivia fun at Mox Boarding House in Bellevue! Mox is a gathering place for gamers and geeks of ALL AGES. However, they also serve beer and wine and other food-type goodies. The Bellevue location is at 13310 Bel-Red Rd, Bellevue, WA 98005. It’s a really cool space, and coming to our event would be the perfect opportunity to check it out! It’s on Sunday, September 9 from 2:00 to 4:00 p.m.
To participate, there’s a $7 per-person ticket price. We’re capping teams at 6 people. Feel free to either come with a team or on your own. There will be tons of folks to join up with once you’re there. While trivia will be the main event, we’ll also have other activities going on. We’ll be selling passes to GeekGirlCon ’18! We’ll be nerding out in Mox’s big tournament room, and there will be servers around to take food and drink orders (there’s a full restaurant!). Finally, know that by coming out, you’ll be supporting GeekGirlCon or, as I like to call it, your favorite geeky org and the best weekend of the year! Come See Us at Seattle Mini Maker Faire 2018! 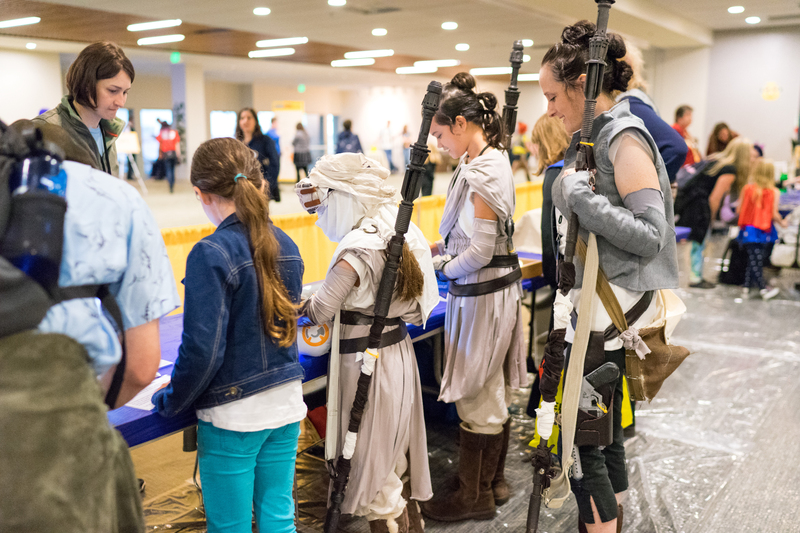 We already told you all about this weekend’s Seattle Mini Maker Faire in this month’s Geek About Town, but what we didn’t share is that MoPOP invited GeekGirlCon to participate! Come check out our talk on exploring and celebrating the contributions and legacy of women in science, technology, comics, game design, and more, then stop by our booth to get your tickets to GGC18! Source: Giphy. Description: a corgi jumping excitedly as he waits for his bowl to be filled. What? Seattle Mini Maker Faire is the greatest show (and tell) on earth! Part science fair, part county fair, and part something entirely new, Maker Faire is a gathering of tech enthusiasts, crafters, educators, tinkerers, hobbyists, engineers, science clubs, authors, artists, students, and commercial exhibitors. You won’t want to miss it! Do you love movies? Events? Community? If so, join us Friday, August 10 for the 16th Annual Skyway Outdoor Cinema Festival’s showing of Wonder Woman! GeekGirlCon will once again be emceeing the pre-show with a trivia contest to give away some 2-day passes to the con! Source: Giphy. Description: a gif of Wonder Woman climbing out of a trench into enemy fire and stopping a bullet with one of her gauntlets. The showing will take place at 12702 Renton Ave S, Seattle 98178 behind the 7-11. The pre-show will kick off at 8:00 p.m., so plan to arrive and get settled by 7:00 p.m.
For additional details, info about which food trucks will be there, helpful tips, and more, check out the Facebook event page.